A variety of ultrathin nanomechanical diffraction gratings that have been fashioned from the “wonder material” graphene have been created by an international team of researchers. The interference pattern produced using a single-layer graphene membrane that was 250 nm long and so does not curl up into a scroll. The team wanted to reduce the thickness of such gratings to the ultimate physical limit – that of a single atom. The researchers say that their graphene gratings are 10 times thinner than previous beam splitters for atoms, molecules or clusters and are even four orders of magnitude thinner than the width of a typical laser grating. As quantum mechanics allows for a particle to simultaneously have a wavelike and particle-like nature, matter-wave interferometry is an essential way of studying the fundamental nature of such particle and making precision measurements. There are two basic types of beam splitters used in interferometry: amplitude beam splitters, which are based on photon recoil and are independent of the particle’s position, and wavefront beam splitters – actual mechanical or optical gratings that essentially slice a wavefront. 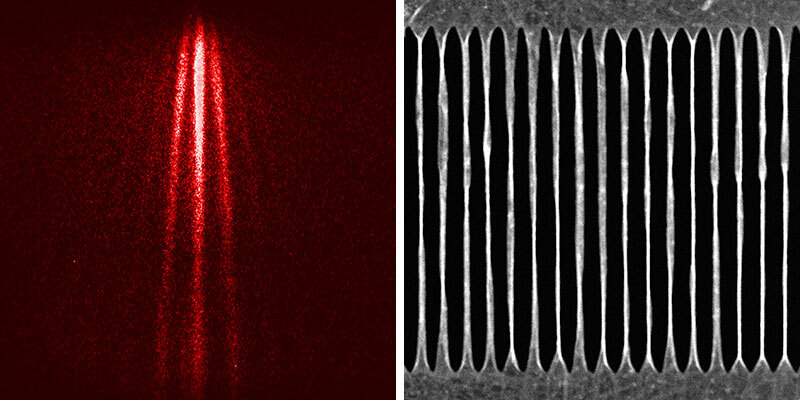 Mechanical gratings, which are typically 100–200 nm thick, have been in use since the late 1980s, and these nanomechanical gratings are “universal” in that they can diffract everything from an electron and a neutron to larger molecules and clusters. An optical grating, on the other hand, would require very intense laser power at 200 nm, which would be difficult to produce continuously. So while mechanical gratings seem like the superior choice, they do have one fundamental stumbling block that crops up for more complex particles, such as large biomolecules, that are highly polarizable. Such particles are affected by certain perturbations that arise due to the presence of van der Waals forces between the particles and the grating walls. These interactions would “dephase” the interferometry, lowering the resolution of the interference pattern or not letting it form at all. As a way of getting around this, Christian Brand, Markus Arndt and colleagues at the University of Vienna were keen to reduce the thickness of the grating slits as much as possible. “Graphene is the most natural candidate for that, and even though membranes of that material have existed for quite a while by now, no one had sculpted free-standing structures as we needed them,” says Arndt. The Vienna group teamed up with Ori Cheshnovsky and colleagues at the Tel Aviv University to fabricate a variety of free-standing 2D gratings. The team made single-layer graphene, bilayer graphene, single-layer graphene suspended in a silicon-nitride grating and a carbonaceous biphenyl membrane. While such membranes have become increasingly accessible, Brand says that “it had been largely unexplored how to sculpt them on the nanoscale, such that they form stable free-standing masks.” Once the membranes were made and used as gratings, Arndt and colleagues used them to diffract phthalocyanine molecules – a commonly used blue-green dye that fluoresces when illuminated with a laser – and found that they could get fairly high-resolution interference patterns. The team, however, was in for a surprise when it studied its single-layer graphene gratings using high-resolution microscopy – it found that the membranes had spontaneously self-organized to form nanoscrolls. “The graphene nanoribbons had rolled up by themselves to look a bit like an array of papyrus rolls or hollow strings,” says Arndt, who adds that such nanoscrolls are interesting nanostructures, independent of their matter-wave experiments. “The discovery of the nanoscroll gratings was an accident, but we like it since we were surprised how high a quantum interference contrast we can get with them and how stable gratings they form,” he says. The researchers did manage to produce single-layer membranes that remained flat, by using nanoribbons that were no longer than 250 nm. 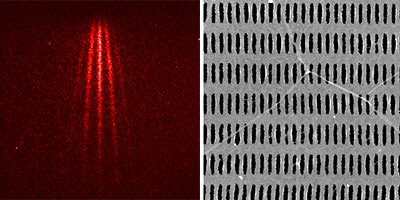 The interference pattern produced using a single-layer graphene ribbon that self-organized into a nanoscroll. The van der Waals interaction is an electrodynamic attraction between neutral particles and neutral grating walls and is caused by spontaneous quantum fluctuations of the charge distributions. This force attracts the molecules to the grating walls in the researchers’ experiments. While the effectively conservative force does not normally induce decoherence in matter-wave interferometry – because it does not store information about the particle’s path through the grating – it effectively narrows the slit. This has both positive and negative outcomes. The narrowing of the slit means that the particles going through have very high diffraction orders – a boon. However, the van der Waals force also disperses the particles over all these orders, meaning that the signal per diffraction order drops by a similar factor, and this is bad. This low signal is especially a problem when it comes to large and highly polarizable particles because it brings into play the Heisenberg uncertainty principle. This is because the interaction with the slit can, in theory, make a slit recoil, thereby inadvertently revealing which path the particle took, immediately destroying its quantum nature. For this not to happen, the grating, in this case, needs to be sufficiently well-defined in position space, such that its momentum uncertainty is larger than any recoil imparted by the diffracted molecule. “What our experiment shows, however, is that high-contrast interference is still possible,” says Arndt. Indeed, this very same scenario was one of the topics that Bohr and Einstein discussed in their famous debates, and the researchers’ findings agree with Bohr’s reasoning. Story Source: The above story is based on materials of Nature Nanotechnology found on physicsworld.com. The original article was written by Tushna Commissariat. Image credit Brand et al./Nature Nanotech. 10.1038/nnano.2015.179/ University of Vienna.